This is a sponsored post. I received compensation in exchange for posting this event. Sponsor is responsible for prize fulfillment. 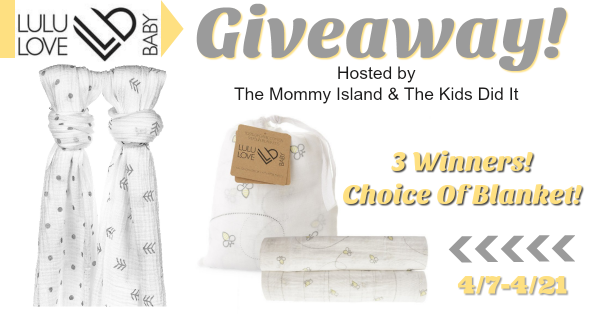 Welcome to the LuLu Love Baby Muslin Swaddle Blanket Giveaway! Hosted by The Mommy Island and The Kids Did It and joined by several amazing sites. LuLu Love Baby is owned by Elizabeth the mother to sweet Lucia (LuLu) who inspired Elizabeth to create these lovely and useful swaddle blankets. She hopes to continue offering new trendy designs that parents and caregivers will love to wrap around their greatest tiny treasures. If you're prepping your hospital go-bag for the arrival of your sweet pea then be sure to pack a LuLu Love Baby swaddle blanket! The possible uses for these luxurious swaddle blankets are endless. You might want to throw it over your shoulder as a nursing cover or burp cloth, perhaps even keep your favorite design nearby to wrap your newest love. The perfect gift idea for any baby shower, LuLu Love Baby Blanket is currently available in three gender neutral designs. Sharing Is Caring! Give Us A Retweet! Three lucky entrants will be selected by the entry form to receive (1) LuLu Love Baby Blanket! (ARV $30) Each winner will have their choice of design (subject to availability.) Open to US, 18 years and older. Open for entry from 4/7-4/21/17 at 11:59 pm EST. Winner(s) will have 24 hours to respond to notification email to claim their prize or a new winner will be selected. Disclosure: Participating blogs are not responsible for prize fulfillment. This giveaway is in no way associated with Facebook, Twitter, Instagram, Pinterest or Google. Void where prohibited. My favorite is the birds and the bees design. Thanks so much. These swaddle blankets soubd great i wish id got some of these when my son was younger. I love the Feather & Polka Dot design.